So this cheesy onion, chorizo, spinach and artichoke pizza was not meant for today, but let’s just go with it. I mean, let’s face it, pizza is good no matter what. See, I wanted to save this pizza (here I go saving recipes again) for next week. It’s perfect for Monday night football and I thought posting it next week would be a little better idea, seeing as football starts on the eighth… but then this whole thing involving some chocolate, an obscene amount of eggs and a little powdered sugar happened and it consumed my life for the last three days. Meaning I didn’t get to make the recipe I wanted to for today. 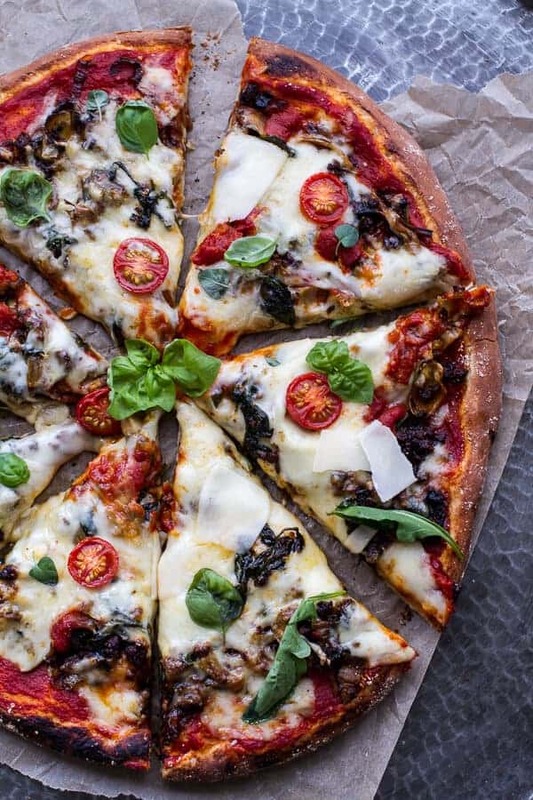 That recipe was a tad more summery than this pizza, but… oh well, you can never really go wrong with a great pizza. I do want to tell you that after three failed attempts I finally got the recipe I have been working on (for way too many days) right. YEAH! It’s coming soon and it is so good. But oh my gosh, it almost killed me in the process. Anyway, the other week I realized it had been far too long since I had made pizza. With my family being gone most of the summer, pizza just didn’t happen that much. One little person, plus too many recipes being made each day equals just a lot of food. A lot went into the freezer, but my weekly pizzas did not get made. Well, everyone’s back and food is literally disappearing by the second. So easy homemade pizzas it is. It’s a no brainer. Everyone eats pizza. Of course I had to make one minus any of the green stuff, but at least they eat tomato sauce. Not the actual tomatoes themselves, but they’ll eat tomato sauce. Craziness. This pizza was one of those pizzas that just happened. Pretty sure it was a Friday night and I am pretty sure I was basically just grabbing everything that was left in fridge. To be honest, this is how I used to cook. I would look at what was in the fridge, figure out what to make from there… and hope it turned out. I am a little more planned now since I am making so much more food, but I actually love when I get to just have fun in the kitchen and not worry TOO much about how it is going to look or taste. That is when I can really be most creative. I am not as concerned about whether people will like it, if the flavors are too weird, if the recipe is too long or hard, if the colors look horrible or how the heck I am going to photograph it. I almost forget sometimes what it feels like not to cook for the blog. It is these times when I actually get the rare chance to cook just because we need dinner and it’s not already made. This is when the best recipes often happen. It’s the whole no pressure thing. When I don’t think and I just do, things just seem to work. I mean, sometimes they turn out terrible, but most of the time they end up being some of my favorite recipes. That is this pizza. I wasn’t sure where I was going with it at first, but then I remembered this dip and I sort of went with those flavors. 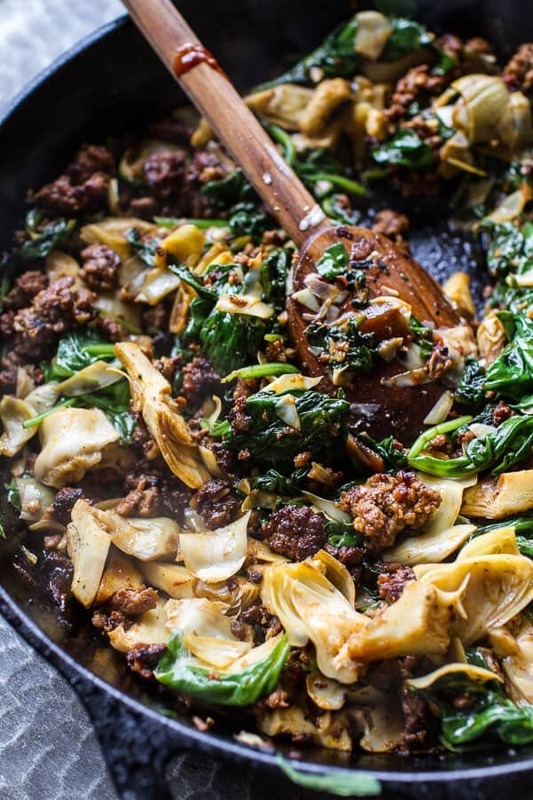 Caramelized onions, chorizo, spinach and artichokes. Such a great combo. The caramelized onions make the pizza, but really, so does the chorizo. And umm, isn’t chorizo used in a lot of breakfast hashes and things?? See, I think it is. This means that this pizza would be amazing with a fried egg. Not gonna lie, if you add a fried egg (or two or three) you’d be my hero. Pizza plus Thursday equals good prep for Friday… and football! Cheesy Fontina Caramelized Onion and Chorizo Spinach + Artichoke Pizza. In a large skillet, add the olive oil over medium-high heat. Add the onions and 1/4 teaspoon each of salt and pepper. Cook, stirring constantly, until the onions begin to soften, about 5 minutes. Continue cooking and scraping the browned bits off the bottom of the pan frequently until the onions are golden brown, about 20 minutes. Remove the onions and place on a plate, set aside. To the same skillet that was used for the onions, add the chorizo and brown all over, about 5 minutes. Once the chorizo is browned, add the garlic and chipotle chilies, cook another minute or so. Stir in the spinach and chopped artichokes until the spinach has wilted. Remove from the heat and stir in the basil. Once the pizza dough is ready, lightly flour a counter. Use your hands or a rolling pin to roll the dough out until you have a flattened disk. Place the pizzas on a greased baking sheet and then use your hands to gently tug, pull and push the pizza dough into your desired shape. Spread the tomato sauce over the dough. Add the caramelized onions and chorizo mixture, you may find there is a too many onions and too much chorizo mixture. If that is the case, just use however much you like and save the remaining onions + chorizo for another pizza or another use. Add the shredded fontina cheese over top the chorizo mixture. Bake the pizza for 25-30 minutes or until the cheese is all melty and gooey. Remove from the oven and top with fresh basil and manchego cheese. EAT! 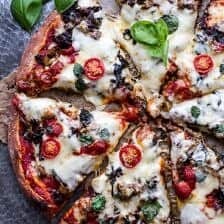 *Double this dough recipe to make two pizzas, there is enough toppings for two pizza's if desired. 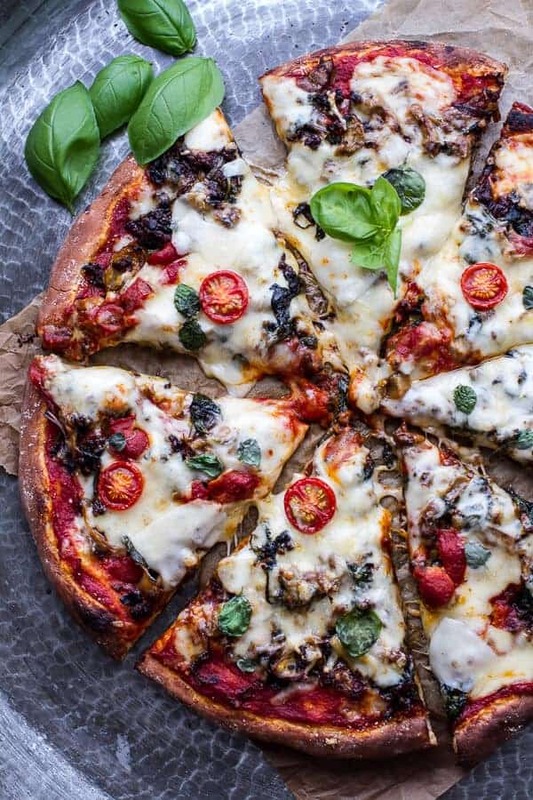 **Feel free to cook this pizza which ever way you please. Sometimes I use a baking stone and cook the pizza at 500 degrees F. for about 15 minutes. 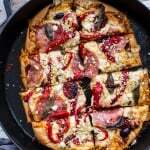 I also love grilling pizza like I did [here | https://www.halfbakedharvest.com/toasted-walnut-pesto-caramelized-nectarine-pizza-wspicy-balsamic-drizzle/]. Hey, and I keep hearing that Thursday is the new Friday? Is this true? Because I think I like the sound of that. WOW! This pizza sounds delicious! I love your pizzas and I didn’t realize how long it had been, but now I realize it had been too long. 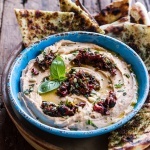 I’m intrigued about this 3 attempt awesome recipe…happy thursday! This looks amazing – I would eat it happily! 🙂 And you know what they say – there’s no such thing as bad pizza! I would happily eat an entire one of these! Looking forward to seeing the recipe!! Pizza is always a good idea. This looks fantastic! How did you get your crust so even and deliciously golden brown, and BEAUTIFUL?? It looks like coal fired pizza. Please share your secret! Yes. Just yes. To all of this. And especially the “toss a fried egg on” part – that is SO happening. Another winner Tieghan! Looks delicious! 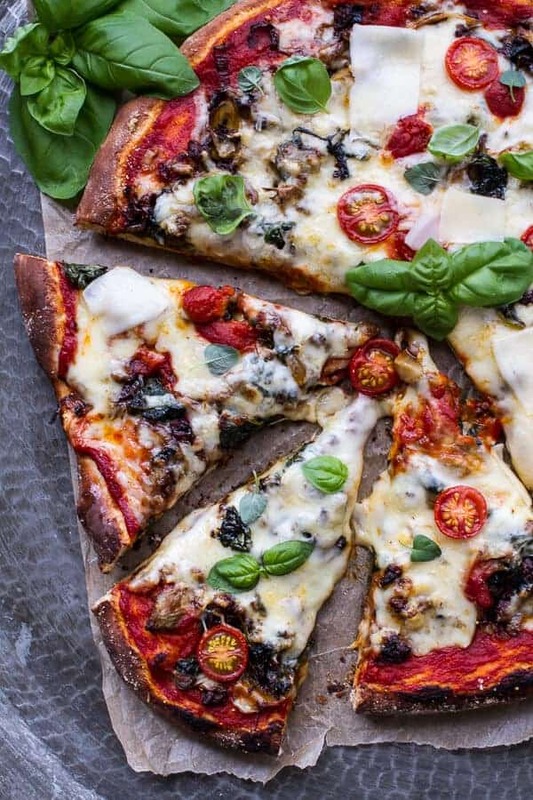 One gorgeous pizza! Such yummy flavors! 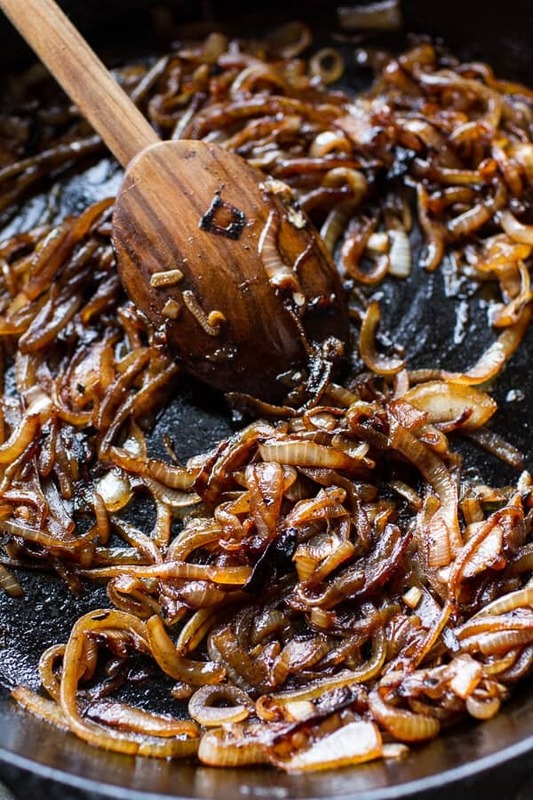 fontina and caramelized onions might be two of my favorite foods… ever. ugh i’m sorry about that other recipe testing fiasco. i am in the midst of one right now… so much crappy cake, so much frustration!!! oyoyoy. it’s time for pizza friday, methinks. Is it bad I want pizza for breakfast now?? Oh my gosh. Such an amazing pizza! 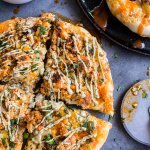 Totally love the caramelized onions and all the cheesiness! This looks amazing! I love artichokes on pizza! I want to try this with vegan chorizo. My favorite thing is to look in my fridge and use up all the random ingredients in a dish. A lot of the time that ends up being a chili or stew of some sort but I definitely have done pizzas and tacos before as well. I love this chorizo, artichokes, and caramelized onion profile. Great work! 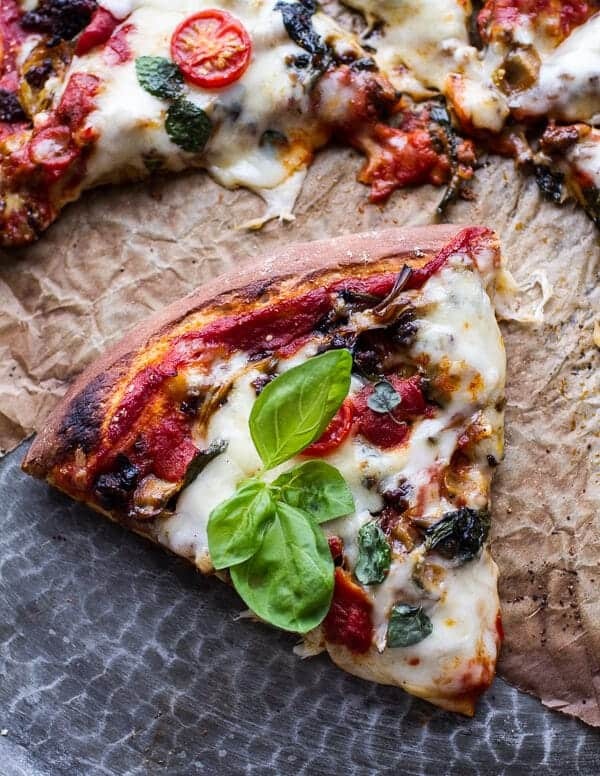 Love spinach/artichokes/caramelized onions on pizza…..chorizo looks like the perfect addition! 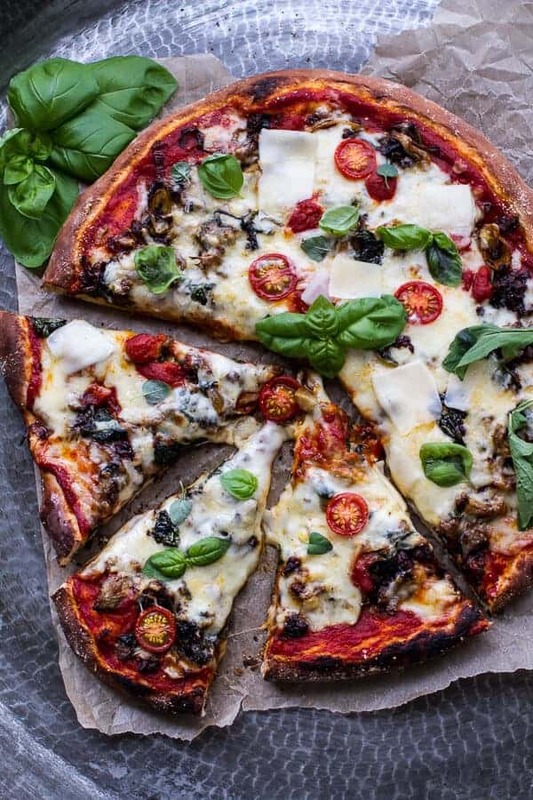 Only you could make me crave pizza at 9am, this looks epic! Your writing is too cute. Love reading the blog and I’m sure it’s good to have everybody home again! 🙂 Now I need pizza for lunch today! I haven’t started my new blog yet but please be know, You will be on my list of Inspirations. I think you what you do is just Art and you are seriously AMAZING!!! Oh my gosh, THANK YOU! Good luck with the new blog! Beautimus! And now I need to make pizza tomorrow. Thanks for the inspiration! Thank you!! Hope you are having a great weekend, Aimee! Looks amazing! I’m going to make it this weekend! Thanks so much Kate!! I do mean basil, so sorry about that. Fixing the recipe now! Your photography is soooo lovely! This pizza is frickin’ epic! Thanks Alanna! Hope you are having a great weekend! 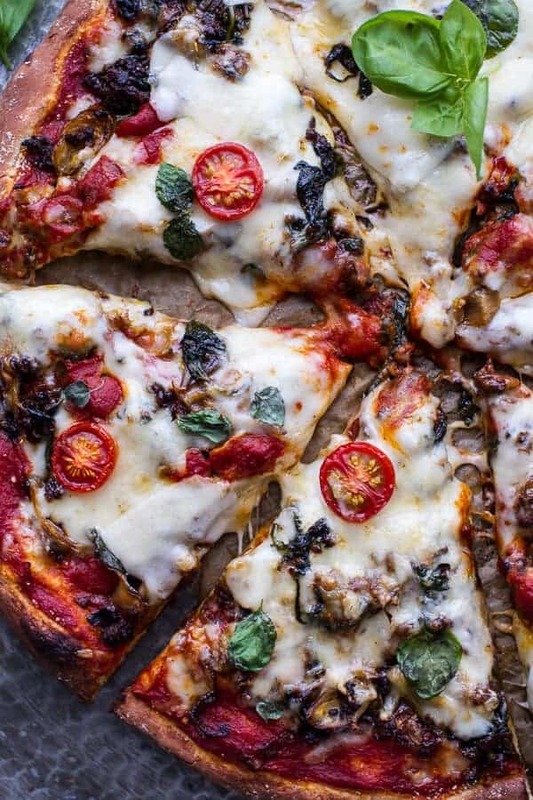 I want a fork + those caramelized onions first, and then to eat this entire pizza. Please. Haha! Thanks! Have a great Labor day weekend! Made this last night for dinner. It was delicious!!!! Love the flavors of the chorizo, onions and chipotle. We put it on the grill at around 350 using a gas grill. I rotated the crust a few times to even out the cooking/browning. Turned out perfect. I have had this on my list of pizzas to make for awhile and finally made it last night. As always, another great HBH recipe with an unexpected but pleasant flavors. 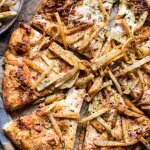 A fun homemade pizza recipe and perfect for winter since no one objects to hot oven when the temps are so cold. I am so glad you enjoyed this Rachel! Homemade pizzas are one of my favorites for a cold night, especially because they’re so fun to make! Thank you! I never thought of putting chorizo on pizza until seeing this! It was yum, thanks!